Joanie Clothing is a unique womenswear brand with fun, flirtation and femininity at its heart. Joanie Clothing is passionate about making beautiful clothes, lovingly fashioned with a pinch of playfulness, a splash of quirkiness and a healthy dose of nostalgia. Whatever the occasion, the Joanie Clothing girl exudes an undeniable, effortlessly cool aesthetic and stands out from the crowd without making noise. Believing that the Joanie Clothing look is for every body, Joanie’s pieces are always available in sizes 8-22. Joanie Clothing wants to be inclusive, not exclusive and celebrate individuals who know their own style; bringing them together as a united community where everyone is welcome. 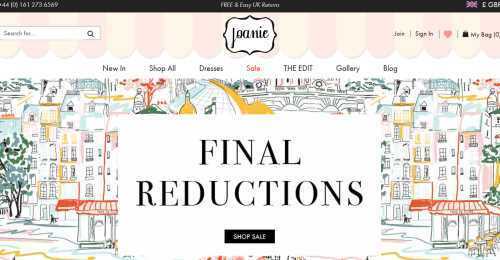 Sale and offers from Joanie Clothing - Up to 40% off! Have a closer look at all the Sale and offers items at Joanie Clothing and save up to 40% Verified two days ago. Valid until further notice. Joanie Clothing discount code not required. Verified two days ago. Valid until further notice. Joanie Clothing discount code not required.